Brexit deadlock: Theresa May's twice-defeated withdrawal deal is set to come back before the House of Commons Friday. What now for Theresa May? The PM told MPs Wednesday she would step aside as Prime Minister if they backed her deal. Even after that intervention she's still struggling to get the numbers. Meanwhile, Parliament says no: Lawmakers voted on a series of Brexit options on Wednesday night after seizing the order paper from government ... but rejected all eight alternatives. It looks like March 29 – originally set as the day the UK would leave the EU – will a big Brexit day after all. 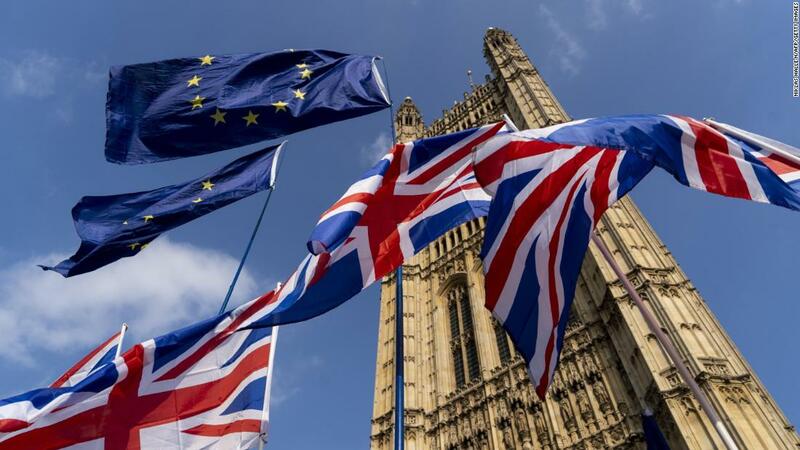 UK lawmakers have agreed to sit on Friday and vote for a third time on Theresa May's Brexit deal with the European Union. We're wrapping up our coverage for the day. Come on back tomorrow and join us for more Brexit chaos. The debate starts at 9:30 a.m. local time (5:30 a.m ET) and the all-important vote will be at 2:30 p.m local (10:30 a.m. ET). Theresa May "threw herself on her sword, and missed"
This is a prime minister that threw herself on the sword and missed! It is a good joke – so good, in fact, that the writer of this live coverage made it first, in the opening post this morning. Oliver Letwin brought about the indicative votes through an amendment to May's Brexit plan. While lawmakers squabble about what they may or may not be debating tomorrow, let's look ahead to Monday -– the second day of indicative votes in a process controlled not by the government, but by the former minister and current MP for West Dorset, Oliver Letwin. If Wednesday was the group stages – or, as American sports fans might say, the regular season – Monday is intended to be the playoffs, where the biggest winners (or rather, smallest losers) advance to a straight vote. It's expected MPs will only be able to opt for one option on Monday, in order to provide a more conclusive result. Exactly how many choices will be put to them remains to be scene. That view was echoed in the Commons, where former Conservative minister Edward Leigh said "there is nothing to stop" Oliver Letwin -- who orchestrated the indicative votes process -- from "whittling down the options to one option, which almost certainly given the results last night would be permanent membership of the customs union." "There is nothing to stop him putting this in a Bill, there is nothing stopping him making that an Act of Parliament and then the choice will be between -- and I say this to my colleagues - permanent membership of the customs union or a general election," he added. A customs union plan came the closest to reaching a majority of voting MPs last night, losing by 271 votes to 265, while a second, confirmatory referendum picked up the most votes in favor – that plan lost by 295 votes to 268. And Chuka Umunna, an Independent Group MP and leading campaigner for a People's Vote, is optimistic the plan will have a hearing. "We were never going to get a result that determined what we were going to do next," he told the BBC. "This is the first part of a process... the second part is due to be on Monday, and obviously I'm happy because the People's Vote option polled the highest." But he suggested there may be more than one option for MPs to chew over. "We now need to whittle down the options further on Monday, to maybe two or three options, and then make a decision," he said. Speaker of the House, John Bercow, confirmed to MPs that he met Attorney General Geoffrey Cox three times over the course of Thursday – at 8:30 a.m. (4:30 a.m. ET), 2 p.m. and again at around 4 p.m. Some lawmakers have questioned Bercow on his meetings with Cox, which were about ensuring the government's Brexit bill was substantively different to the previous two. The Speaker later told MPs the new motion "complies with the test." Labour's Shadow Brexit Secretary, Keir Starmer, has reiterated that the party will not be voting for the Withdrawal Agreement on Friday. He said the Agreement cannot be split from the Political Declaration for because it contradicts the wording of Article 50, as well as previous comments from both the EU and Theresa May. He also notes that the next stage of the Brexit process would be controlled by a different prime minister, following May's commitment to resign if it is passed. "What the Government is doing is not in the national interest and that’s why we will not support it tomorrow," he wrote. Several opposition MPs have pointed out that Theresa May and the EU have said, in the past, that the Withdrawal Agreement and the Political Declaration cannot be separated. Indeed, to be formally ratified, both must be agreed. The government's top legal officer, Attorney General Geoffrey Cox, rose to his feet to give his legal view. He noted that the offer of an extension to the Brexit process from the EU was dependent on the Withdrawal Agreement being approved by tomorrow. "The view of the government is simply we could not let the time limit expire at 11pm tomorrow, of allowing this House the opportunity of availing itself of that right," he said. Meanwhile, the office of Andrea Leadsom, leader of the House of Commons, has tweeted out the text of the motion to be debated tomorrow. What does Friday's vote mean? The Commons' vote on Friday will not quite be a third "meaningful vote" on Theresa May's Brexit deal, as required by the European Union (Withdrawal) Act 2018. UK politics nerds will know very well that Section 13 requires both the Withdrawal Agreement and the Political Declaration to be approved in order for the treaty to be ratified. What that means: The government is trying to square a circle. It needed to fulfil the Speaker's demand that another vote on the Brexit deal needed to be substantially different from before. As the leader of the House, Andrea Leadsom, told MPs, it also needs to get approval for the Withdrawal Agreement qualify for the extension to the Brexit process that was granted last week by the EU. If the Withdrawal Agreement passes tomorrow, the Brexit date will automatically be pushed back to May 22 -- but MPs will still have time to debate the future relationship with the EU and approve that relationship by voting on the Political Declaration at a later time. A third vote on Theresa May's Brexit deal has been allowed by the Speaker, John Bercow, and has been tabled for Friday. The vote will be on the Withdrawal Agreement, which sets the divorce terms, and not the associated Political Declaration, which deals with the future relationship between the UK and the European Union. That split satisfies the Speaker's ruling that the vote had to be substantively different from the two previous occasions on which the House of Commons voted on it. In case the indicative votes process wasn't confusing enough already, the Speaker, John Bercow, has just told MPs that the votes were counted incorrectly for three of the eight motions. Kenneth Clarke's motion for a customs union, which was the closest to achieving a majority, was in fact even closer than thought – it lost by 271 votes to 265, not 272 to 264, as announced last night. That's a loss of six votes, not eight.